Had he not scored the dramatic late winner in Ljubljana last night, Monday morning probably would have greeted Wayne Rooney with the hostile but familiar headlines that have so often been associated with his international career, criticising an inability to regularly transfer his club form to an England shirt. There was an apparent sense of relief as Rooney darted towards the travelling supporters in the Stožice stadium before sliding onto his knees and pointing to the heavens. Indeed, the England captain would have been fully aware that he had already missed two gilt edged chances in the second half. First he ballooned Raheem Sterling's through ball over the bar, and before he had a chance to cleanse his mind of that moment, he was skying the same provider's cutback into the netting behind the goal. 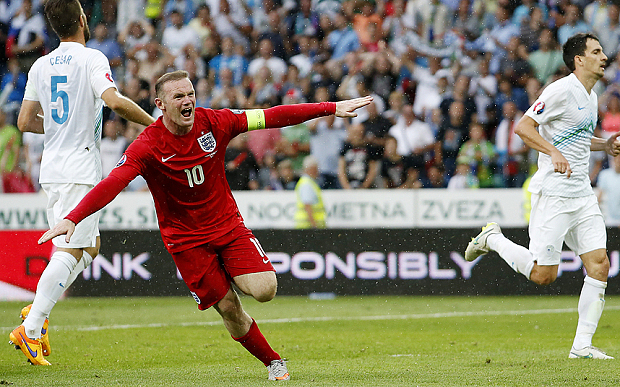 Rooney celebrates his late winner in Slovenia. It would have been easy for a lesser player to retreat into his shell and stop seeking out the opportune moments, but that is not in the nature of a world class talent like Rooney. When it mattered most, the centre-forward rediscovered his composure to score the goal that gave Roy Hodgson's side a sixth win from six qualifiers, and with it Rooney moved to within one of Sir Bobby Charlton's goal scoring record. Without a goal since April, it could be argued that the infatuation with Rooney and the record has inhibited the England striker's performances, but having represented his country for over ten years, Rooney is no stranger to the expectation for him to prolifically lead the national team's front line. However, during what is a period of transition for England, the burden on Rooney to find the back of the net is now greater than ever. The 29-year-old is the final remnant of the so called 'golden generation' of English footballers that were tipped to deliver the nation's first major trophy since 1966. The retirement of Rio Ferdinand coupled with Steven Gerrard's move to the MLS draws a symbolic curtain on the golden era of English talent leaving Rooney to pick up the pieces. With no Gerrard or Lampard to provide goals from midfield, the added responsibility for Rooney to lead by example as well as provide game winning moments is the most unenviable of tasks. Rooney is the last of England's 'golden generation'. However, Rooney has never been given an easy ride in his England career, and there is no doubt that the Manchester United striker is one of few individuals who will be relishing such a monumental challenge. Ever since he burst onto the international scene at Euro 2004, Rooney has been the most scrutinised of any player in an England shirt. The fact is, Rooney's performances will always be closely dissected because he is England's best player. With the hopes of a nation so often placed on his shoulders, Rooney was made a scapegoat after disappointing World Cups in South Africa and Brazil. Despite this, he has quietly accumulated what will soon be the record number of England goals and will rightly be remembered as one of the finest players this country has ever produced. There is no doubt that Rooney can have a frustrating tendency to pull on an England shirt and suddenly sink to the level of a Sunday League player. However, that could have easily been said about every individual who played in the dire friendly against Ireland last week. Rooney is set apart by his ability to grasp the game winning moments, just as he did in Slovenia last night, and just as he did with his free kick against Estonia back in October. 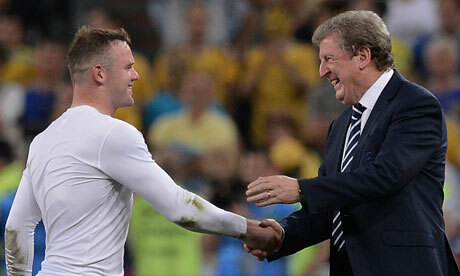 Rooney is integral to Hodgson's new England era. The sporadic calls in the past for the striker to be dropped from the national team have always been rash and impulsive. The idea that this England side would prosper without him is a myth, and as long as he is fit, Rooney will always be the first name on Hodgson's team sheet. No individual is determined to succeed with England as much as Rooney. He knows that international accolades set the great players apart from the good ones, and it is that determination, that passion that he must communicate to an England team with lots to learn. Rooney has had to deal with the burden of expectation throughout his career, and his experiences of international football have moulded him into the captain Roy Hodgson needs to lead his new generation of England footballers. Until now, his role within the national side has so often been undervalued, but England have become more reliant on Rooney than ever, and when he does finally eclipse Bobby Charlton's record, perhaps he'll be in danger of receiving the recognition such rare talent deserves.